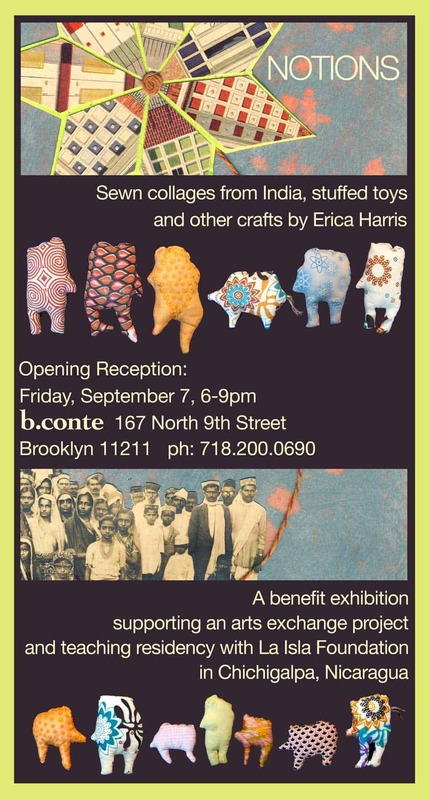 b. conte at 167 North 9th Street in Williamsburg, Brooklyn, will be hosting my next exhibit: Notions, Sewn Collages from India, Stuffed Toys and Other Crafts. This is a benefit exhibition supporting my upcoming arts exchange project and teaching residency with La Isla Foundation in Chichigalpa, Nicaragua this November. La Isla Foundation is dedicated to fighting Chronic Kidney Disease, or CKD, among agricultural workers throughout Nicaragua, primarily in the sugarcane industry. They provide vital assistance to these communities, in which more than 70% of men and 30% of women have died from CKD. They work with health officials and researchers to provide better medical treatment for the sick, study the causes of the epidemic, and support impacted families. By providing direct aid, the tools for self-empowerment, and legal recourse when warranted, La Isla is instrumental in improving working conditions and protecting human rights. La Isla supports and organizes workers and their families through education programs, health initiatives, and economic development projects. Recent projects include the renovation of an elementary school, the re-opening of a formerly abandoned local health clinic, and the development of a sustainable agriculture program in community gardens. Through the Marmalade Project, La Isla trains local women to produce and market marmalade made from abundant, locally grown fruits. All participants in the program are widows who have lost their husbands to chronic renal insufficiency and are struggling to provide for their families.